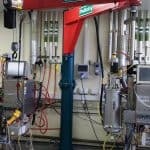 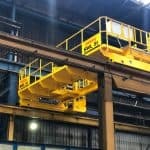 Busch Vacuum Pumps and Systems are supplied with four underslung manual cranes with gantry steelwork by Pelloby. 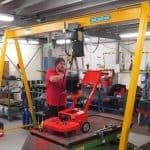 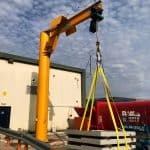 A leading surface preparation company orders a Pelloby 500kg mobile portal crane with an electric chain hoist. 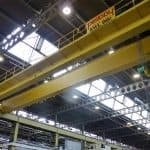 A double girder crane & two monorails for helping with waste disposal at the BMW Group’s Swindon MINI Plant. 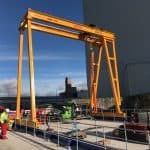 Very small capacity knuckle jib crane supplied to lift bioreactor motors and head plates. 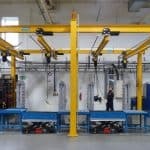 Following a similar installation in 2015, two more 35 tonne cranes have been supplied for BMW. 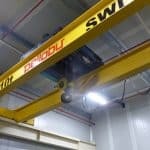 This one tonne capacity jib features an alternative method of feeding power to the crane to better suit the client’s workspace. 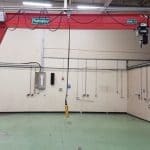 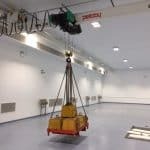 A special electric overhead crane designed to maximise headroom in a cleanroom environment.